Reviews of a plastic tunnel at a supermarket that became the highest rated TripAdvisor attraction in a Cornish seaside resort have been suspended by the website. 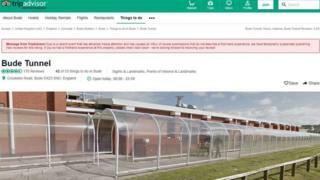 TripAdvisor took the action because of “an influx of review submissions” about the tunnel in Bude that “do not describe a first-hand experience”. The person who originally listed it described the decision as “a shame”. Before the suspension the structure had amassed more than 160 comments. TripAdvisor said the suspension is temporary. Comments from reviewers likened the 70m (230ft) tunnel to the Taj Mahal, and called it a “Hidden Gem”. As a result of the suspension, the tunnel has slipped to second place in the list of ‘Things to Do in Bude“. Oldest person in the UK: How has life changed? A statement from the company continued: “Bude Tunnel is clearly a very well-known place of interest and affection locally, as the many reviews on TripAdvisor demonstrate. In fact, local shops even sell postcards featuring the tunnel. The person who made the original listing, who wished to remain anonymous, said: “A lot of the reviews are real and it’s a shame that people who have written them are not able to see them on TripAdvisor. 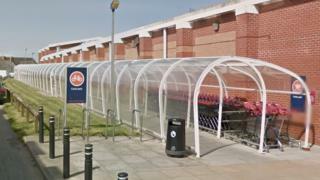 The tunnel links shoppers from the Sainsbury’s supermarket to the car park, protecting them from the rain.